Acta Cryst. (1997). A53, 103-104. Crystallography and solid state chemistry lost one of its great men last summer when Arne Magnéli died at the age of 81. His pioneering work on the structural chemistry of certain transition-metal oxides was a major step forward in the development of our modern conception of non-stoichiometry. Arne Magnéli grew up in Stockholm where he also began his university studies. He started his research career under the guidance of Arne Westgren, Professor of General and Inorganic Chemistry at the University of Stockholm from 1927. Westgren had introduced studies of the atomic arrangement in solids with crystallographic methods at his department and was one of the pioneers of X-ray crystallography in Sweden. 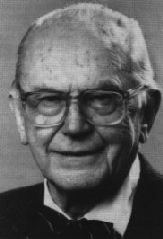 It was also Westgren who introduced another promising young researcher, Gunnar Hägg, into this field and when the latter became Professor in Uppsala in 1936 he built up a very active crystallographic research group in the Chemistry Department. After finishing his licentiate degree in Stockholm, Magnéli also joined this team in 1941 and he made considerable contributions to the development of this laboratory into one of international reputation. Hägg had suggested that he study the systems Mo-O and W-O. Phase analysis revealed that instead of wide solubility ranges as previously suggested, there were several quite stoichiometric phases. Their crystal structures turned out to be quite complex and the determinations were difficult tasks in the 40s. The structures explained their unusual stochiometries, such as Mo9O26 and W18O49. The common pattern he discerned in some of these structures led him to formulate the concept of `recurrent dislocations', later termed crystallographic shear, as a way of changing the stoichiometry without relinquishing the cation's primary coordination requirements. This new structural mechanism gives rise to homologous series of phases (today often called Magnéli phases). His doctoral thesis from 1950 also included substantial work on the tungsten bronzes, for example determination of the fundamental structure of the tetragonal potassium tungsten bronze (TTB). The structure of the hexagonal tungsten bronze (HTB) was published a few years later. In the years that followed, he and his students investigated other oxide systems and found similar homologous series of shear structures, for example in the V-O and Ti-O systems, in phase regions previously believed to be continuous solid solutions. These studies had a strong impact on the conception of stoichiometry and non-stoichiometry. He returned to Stockholm in 1953 to take up a position at the University, which soon became a Chair of Inorganic Chemistry, which he held until his retirement in 1980. He attracted a growing number of students and visiting scientists, initially working on the structural chemistry of transition-metal oxides and alloys. Over the years, the interests and methods of this group gradually widened, but the structural aspects remained in focus. He was an inexhaustible source of inspiration for the research in his Department, always generously sharing his ideas and giving constructive advice, but never insisting on being co-author on publications. Also, as Emeritus Professor, he continued to follow the research in his old institution with great interest and took an active part in projects closest to his heart. Arne Magnéli's scientific knowledge and administrative capacity was soon taken advantage of, on both the national and international scene. In 1970, he was elected a member of the Royal Swedish Academy of Sciences, where he made many important contributions, in particular as Secretary of the Nobel Committees of Physics (1966-1973) and Chemistry (1966-1986). For many years, he was a member of both the National Committees for Chemistry and Crystallography and for several years he also acted as Chairman of these committees. In recognition of his scientific achievements, he was awarded the Gregori Aminoff prize for crystallography in 1989. Magnéli was very interested in strengthening the scientific collaboration between Sweden and other countries, in particular France, Poland and Russia. He took the initiative in several bilateral conferences in this context and participated himself very actively in these, the last one in April 1996 in Russia. For several years, he was also active in the International Union of Pure and Applied Chemistry, IUPAC. In 1988, he was elected Docteur honoris causa of the Université Pierre et Marie Curie in Paris and, in 1989, a foreign member of the French Academy of Sciences. Magnéli was heavily engaged in the activities of the International Union of Crystallography. He served as a member of the Commission on Crystallographic Teaching 1954-1960, where he acted as Chairman for the last three years. He was a member of the Executive Committee 1972-1981 and President of the Union 1975-1978. Magnéli worked very energetically for the free circulation of scientists and during his time as president of IUCr - at the time of the cold war - he had to act strongly to allow researchers from all countries to attend the IUCr Congress; in this context, he even threatened to move the General Assembly to another country. His scientific capacity and effectiveness made Arne Magnéli very much respected and appreciated in scientific circles all over the world. He made many friends due to his modest manners and wide cultural interests, not least in music, combined with fervour and humour. To the very end of his life, he was full of energy and new ideas and his sudden death was quite unexpected.